Check out the following LRB review that goes over the debate Ehsani and Omar Dahi just had on neoliberal economics on Syria Comment. Read the comment at the end. Ricardo and Malthus went over this ground many moons ago. A debate with some legs…. Father Athanasius, a Texas-born Franciscan monk who heads the Christian Information Center inside the Jaffa Gate, said he’s been spat at by haredi and national Orthodox Jews “about 15 times in the last six months” – not only in the Old City, but also on Rehov Agron near the Franciscan friary. “One time a bunch of kids spat at me, another time a little girl spat at me,” said the brown-robed monk near the Jaffa Gate. 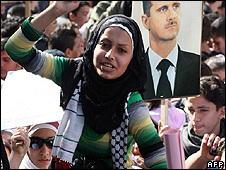 BBC News, Damascus Syria appears to be undergoing a religious revival, most visible in the growing numbers of women wearing the hijab, or Islamic headscarf, and in part led by conservative women preachers. The most influential conservative female religious figure in Syria, 70-year-old Munira Qubaisia, is said to have at least 75,000 followers, and they are growing in number. Her preachers, known as Anseh, tend to come from the educated upper classes. They arrive at their meetings in expensive black cars, well dressed and well spoken, with an air of authority that leaves audiences spellbound. “They helped me; they made me feel more confident. I managed to walk in the streets without fear of men surrounding me and I can even tell people that they are doing wrong,” says Umm Muhammad, a former Qubaisia devotee. Her husband, however, was not happy with the situation. “I don’t mind her going out and doing something useful, but she started to change and wanted me to change as well,” says Abu Muhammad, who works as a taxi driver. A religious conservative in his mid-40s, he says that when his wife joined the Qubaisiat she became more rigid and focused on what he considered to be superstitious details rather than established tradition. “I agree,” says Um Muhammad, who has since left the group. “I admired the way they work and help people in the community but I couldn’t stand the way they want to control our minds and decide for us what is good and what is bad. If you violate the rules and don’t obey the order of the Anseh, it is considered blasphemy.”…. After years of battling to increase the output … Electricity ministry officials say the Syrian-Kuwaiti firm Marafeq is likely to win bidding to build the country’s first private power plant in decades for about 200 million euro. The company, a joint venture between Cham Holding owned by Syrian business Rami Makhlouf, and the Kuwaiti conglomerate Al-Kharafi, is expected to generate 240 megawatts, which is much needed to reduce the severe shortfall in supplies. BEIRUT — While the United States and Europe have been struggling to find a path forward in the Israel-Palestine conflict, Afghanistan and Iran, the strategic ground upon which their assumptions about the region rest has begun to shift dramatically. Most significantly, Turkey has finally shrugged off the straightjacket of a tight U.S. alliance, grown virtually indifferent to E.U. membership and turned its focus toward its former Ottoman neighbors in Asia and the Middle East. Though not primarily meant as a snub to the West, this shift does nonetheless reflect growing discomfort and frustration with U.S. and E.U. policy, from the support of Israel’s action in Gaza to Iran to the frustrated impasse of the European accession process. It also resonates more closely with the Islamic renaissance that has been taking place within Turkey. If Turkey continues successfully down this path, it will be as strategically significant for the balance of power in the region as the emergence of Iran as a pre-eminent power thanks to the collapse of the Soviet Union and the later destruction of Sunni dominance in Iraq by the U.S. invasion. In recent months, a spate of new agreements have been signed by Turkey with Iraq, Iran and Syria that suggest a nascent commonality of political vision. A new treaty with Armenia further signals how seriously Ankara means its “zero problem” good neighbor policy. More importantly, however, the agreements with Iraq, Iran and Syria reflect a joint economic interest. The “northern tier” of Middle Eastern states are poised to become the principal supplier of natural gas to central Europe once the Nabucco pipeline is completed — thus not only displacing Russia in that role but gradually eclipsing the primacy of Saudi Arabia as a geostrategic kingpin due to its oil reserves. Taken together with the economic stagnation and succession crisis that has incapacitated Egypt, it is clear that the so-called moderate “southern tier” Middle Eastern states that have been so central to American policies are becoming a weak and unreliable link indeed. Political players in the region can’t but notice the drift of power from erstwhile U.S. allies Egypt and Saudi Arabia toward the northern tier states, and are starting to readjust to the new power reality. This can most clearly be seen in Lebanon, where a growing procession of former U.S. allies and critics of the Syrian government, including Prime Minister Saad Hariri, Walid Jumblat and, reportedly, some of the March 14 movement’s Christian leaders, are making their pilgrimage to Damascus. That message is not lost on others in the region. If the Obama administration is not fully cognizant of these developments, its awareness will surely be raised as it attempts to mobilize the world for a new round of punitive sanctions against Iran. These sanctions are likely to fail not only because Russia and China won’t go along in any serious way, but precisely because the much touted “alliance of moderate pro-Western Arab states” is turning out to be a paper tiger. Given the shifting balance of power, the “moderates” are in no position to seriously confront Iran and its allies. Hopes that the recent Saudi bombing of the Houthi rebels in Yemen would incite sectarian Sunni hostility toward Shiite Iran have not been realized. On the contrary, the Saudis’ action has been clearly seen in the region as a partisan and tribal intervention in another state’s internal conflict. In Turkey, Prime Minister Recep Tayyip Erdogan has not only embraced the legitimacy of Mahmoud Ahmadinejad’s election, but has insisted as well on the right of Iran as a sovereign nation to enrich uranium. Unlike Western leaders, he doesn’t at all seem inordinately worried about Iran’s course. The U.S. and Europe are going to have to grapple with the pending replacement of its “southern tier” allies in the Middle East by the rising clout of the “northern tier” states. It would be best to make this adjustment sooner rather than later. None of the issues that matter to the West — the nuclearization of Iran, Israel’s security, the future of energy supplies — can be solved by ignoring the emergent reality of a new Middle East. A colourful display of pickles in Damascus. ….. We had a lovely dinner in the airy courtyard of the Yasmeen d’Alep, not to mention a peek at the brand new and super-luxurious Mansouriya Palace . In Syria nothing is over the top because there is no top…. We also ate, of course, magnificently and uninterruptedly. Specific dishes come to mind: among the many mezze or starters, a salad of green olives dressed with pomegranate molasses served at the Club d’Alep; the brain fritters and the perfectly cooked Swiss chard at Smeroud in Aleppo; the spicy lamb in a sour cherry sauce made for us by the chef Marie Gaspard Samra, who gave us a cooking lesson and dinner at her house; the lamb with burghul and chickpeas at Naranj in Damascus; or the candied apricots stuffed with pistachios and dipped in chocolate that I bought from the elegant Damascus chocolate shop, Ghaouri. Yet, at the end of the trip, what remains most precious to me is the sense of having been the guest of a gastronomic tradition of great integrity, cultivated through many centuries and with great passion. According to my guidebook, Syria is nearly self-sufficient in terms of food production. Everything we ate was fresh, local, rigorously seasonal and rich in flavour, whether it was served at the upscale and excellent Smeroud, or at the unexpectedly good roadside “Tourist Restaurant” on the way from Palmyra to Aleppo, or at the tiny ful shop where we joined the local clientele in breakfasting on a dried fava bean soup spiked with olive oil, lemon juice and marvellously aromatic Aleppo red pepper…..
which one to comment on?